Oh, I’m so glad you could make it. To be honest, I’m so glad I could make it too… It has been one of those weeks, you know? But I’m happy to report that it’ll be ending on a high note because today I’m having another one-on-one craftospheric challenge, this time with the redoubtable Mich L. in L.A.! Do you remember the last one-on-one challenge? It was so much fun that I’ve decided to make it a regular feature called “Make It Good”. But I’ll get to that later. For now, to the challenge! What is this challenge I speak of? Well, it’s simple. Here’s what happened. Michelle and I emailed back and forth. We picked a day (today). We had my previous challenger, Aunt Peaches, decide on a challenge. We each created a post with a link to each other’s post, and that’s it! Now your job is to check out what I made, check out what Michelle made, and you’re on your merry way! No winners, no losers, just crafty crafters dancing all around. Now if you haven’t yet heard of my opponent Michelle, well hang on to your hats. 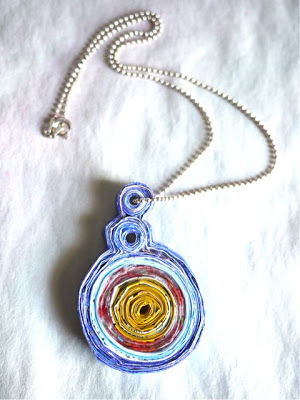 She is a wonderfully inventive jewelry artist who creates the most beautiful and quirky pieces from the humblest of materials. She also hosts a regular spot on her blog Mich L. in L.A. called Guess the Mystery Thing! You MUST check it out. It’s so much fun, and so is she! It is a great honour for me to be challenging her today. Also, she scares the daylights out of me (just a little bit), so if I make it through the challenge, I will be a stronger and better person for it. The Challenge Material: Candy Wrappers! Thou Shalt Stash Bust!… You will try not to buy new stuff. Thou Shalt Honour the Niftiness of Yore!… You will draw inspiration from an outside source. Thou Shalt Share Thine Treasure!… You will swap your results. Thank you ever so much Peaches. Really. You will never know how much I struggled with this confuddling candy wrapper idea of yours. Let me just say that this week will be permanently etched in what is left of my quivering brain. Okay Michele, enough chit chat! Let’s see what you got. For my craft, I drew inspiration from geodes, those spectacular crystal-filled rocky orbs, such as these pictured below (source). See, I know how to follow rules! 1. Using your Exacto knife cut your wrappers into 1/2″ (13mm) strips. 2. Fold the strips in half. 3. 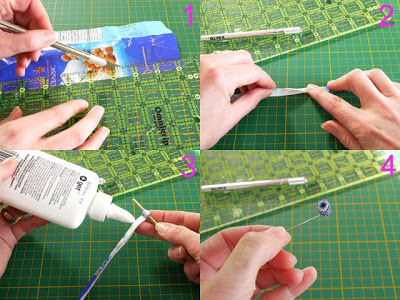 Coil the strips around your narrow stick, adding glue at regular intervals. 4. Remove the bead from the stick once it becomes large enough to work with on its own. 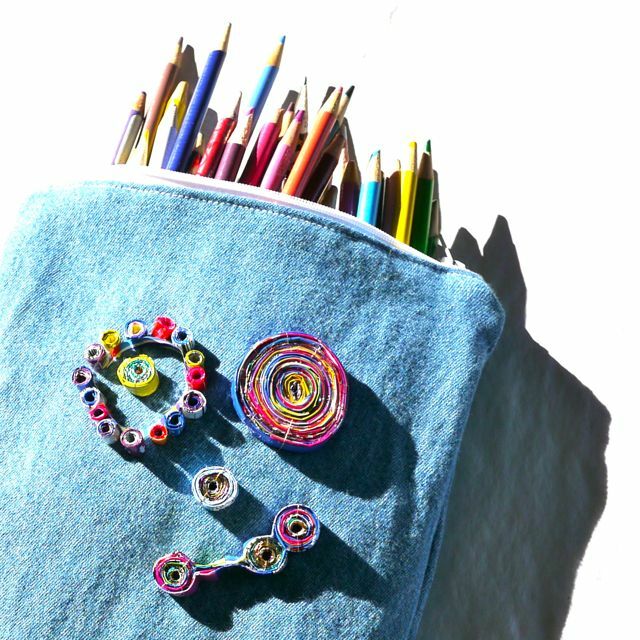 Make your beads as big or as small as you like. Or join a few together. The idea is to experiment and create your very own unique beads! Make a ton and have some fun!!! And finally, here is the self-portrait pouch I put together. Like I said, hard week. 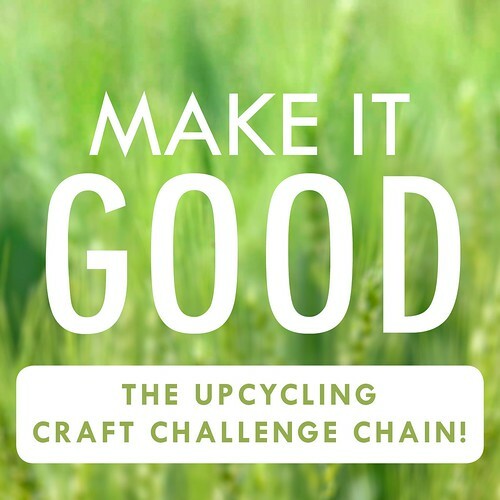 And if you’re at all curious about the “Make It Good” crafter vs. crafter, recycling challenge extraordinaire, please click here for details! Now you have yourself a glorious weekend, and I’ll see you again soon! Amazing, who would have thought. A new twist on the beads we used to make with the church bulletins. Love the self portrait. I have those weeks also. Who am I kidding? I have those YEARS! Siempre es un gusto ver sus reciclados que se conviertan en obras de arte! Always a pleasure to see their recycled to become works of art! …ohhh that is just wonderful!!! What a great idea for a challenge…;-)) Just love it! Well I guess I was right! Enjoyed the post immensely and love everything- especially the pendant and the jar jewelry! My jars would go nuts if they see this!! Michele! J'adore! Me encanta! They are amazing, colorful, sweet and WOW! The self portrait is just ridiculously lovely – you think it's goofy, I can tell, but really it is a work of art. 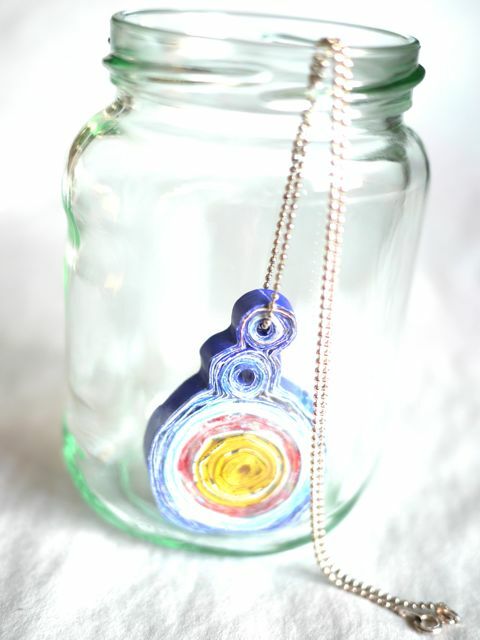 And the necklace and jar jewel are so beautiful, OMGosh, you made jewelry!!! Oh, lord, I am going into exclamation point overload, let me calm down. Thank you SO MUCH for inviting me to craft along with you, it was such an honor. (Well, 'cause you're – ya know – pretty much a genius, and an artist of surpassing talent.) I completely love your and Peach's cool new idea, I am very sure it will sweep blogland. I can't wait to see future Make It Goodness!!! 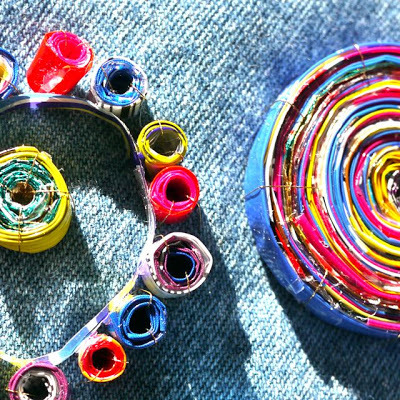 One of the things I most love is the upcycling, I can never get enough green ideas. I'm so happy you made that an integral piece of the concept. That Peaches! She was kind of bossy in setting our challenge, wasn't she? But I loved every one of her rules, they made it extra interesting. I know I created something out of my usual comfort zone, inspired by the two of you! Love the sweet green challenge button, too. I love it Michele!! Your snowman pendant is gorgeous!!! And the Self portrait bag is just so wonderful and quirky!!! You both made such great projects. Loved it!! Michele / Michelle ma belles! You two are rocking this challenge and as I suspected when you put up the teaser post, it's brilliant! What a treat! 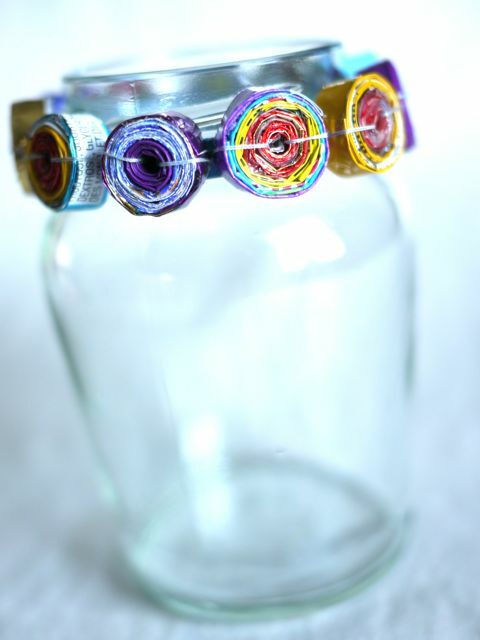 You two are both amazingly craftily resourceful when it comes to making cool stuff out of recycled and repurposed stuff! I swear Mich & Mich are a mitch… err, match made in heaven. You have both amazed me with your interpretations, they could hardly be more different! And Pish Pish, Rules, Rules…you make it seem like I asked y'all to tap dance and eat worms at the same time! You know I just wanted to see what would happen if I spiced up the soup. And, might I add, look what happened? Something BEAUTIFUL. Spicy soup and COOKIE FOR ME! Love this. So excited to see what happens next! This tale of two Michel(l)es is superb! I cannot believe your creativity – you just know no bounds woman. Every time I come here you've made something from almost nothing that is totally unique and mind-blowingly beautiful. Like, EVERY time! Very inspiring. These are too cute! I remember way (way!) back when I was about 16 working on a gum wrapper chain – we all did that to see whose would grow the longest – BUT the catch was you had to chew all the gum yourself. Mine was Juicy Fruit – and I WON! I wish I still had that gum chain. Times were so much simpler and beautiful then. I love your little candy wrapper embellishments. Oh – and I read your "about me" – it made me laugh out loud. We have quite a bit in common – including the cooking husbands! Yeah for US! Those are seriously cool, Michele! I love the pendant on the chain. I hopped over from Michelle's place, and I lurv what you did there! Oh this is too good! I love your jewellery! 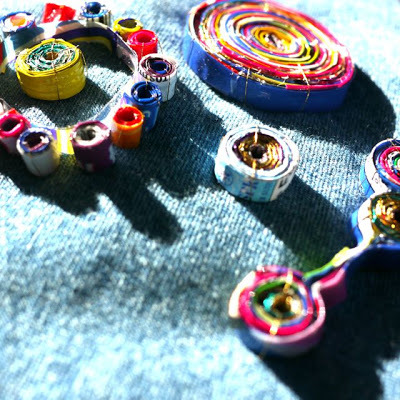 what an interesting and fun challenge – and I love the idea of the make it good ongoing chainy challenge thing! I love how you made jewelry for Michelle and she made NON-jewelry for you! How thoughtful of both of you! And LOVE your self-portrait! And fire in the snowman belly – only you would do that, but it makes me laugh! It must have been a week, but it ended on a nice note. Thanks for all you share with us. You bring smiles to many people, as you can tell by the comments given to you. Looking forward to the upcycling. Wow, this is really amazing, the colours really pop. I especially like that jelly jar, it would make a lovely vase. 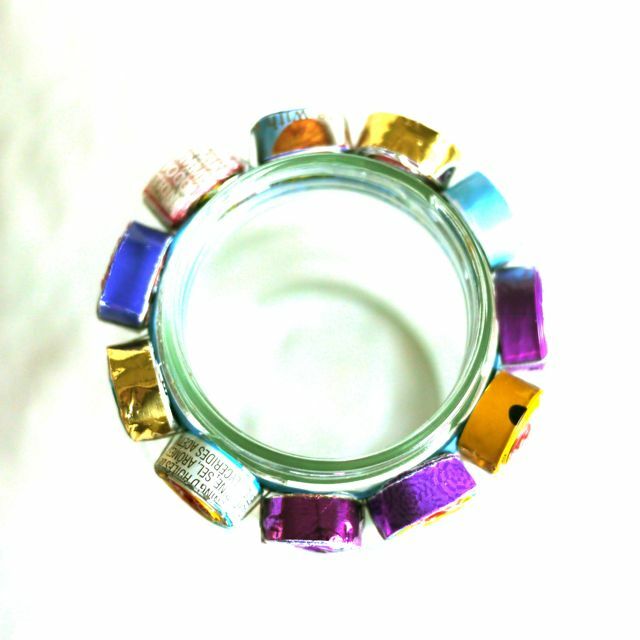 I have always been curious about candy wrapper crafting. I have seen some crafters fuse them together to with irons. I need to try this. Love, love love those yummy concoctions of yours! Puts to good use the remnants of other yummy concoctions!!! K, I wanna know how you had that many candy wrappers in your house. 🙂 Love the geode theme and your twist on it….they are beautiful!! "Make it Good" is very exciting!!! And the results even more! It's so funny! You inspire me. Thanks, thanks!!! Oh, I adore these! Especially the "sunny-bellied snowman pendant," so gorgeous! If you're interested, I would love to link to this tutorial on our site AllFreeBeadedJewelry.com, directing our readers back to your blog. We have linked to several of Michelle's tutorials on our site in the past (with her permission) and feature them frequently. We can always use more recycled jewelry (especially when it's as pretty as this!). Let me know what you think! Thanks for sharing!